Paula Cuellar of Personitas de Colección (Bogotá) creates magic with childlike faces of hand-painted ceramic, and figures richly clothed in suede and leather. Magic begets delight--a child's delight--when Arlequin and Alejo, the angel, the mime called Marcel, and Rosa la Primorosa and Margarita de la Suerte perform a ballet in the trees. 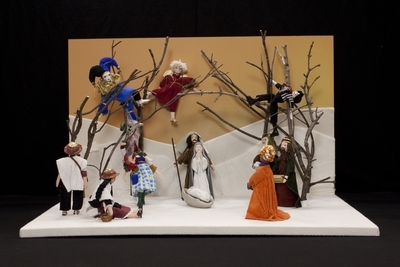 Painted and glazed ceramic figures depicting the nativity of Jesus and created by Paula Cuellar in 2007 in Bogotá, Colombia. Exhibition label originally written by Fr. Johann G. Roten, S.M. for exhibit entitled "At The Manger" and held at Roesch Library, University of Dayton.